Here's one for the cotton lovers. 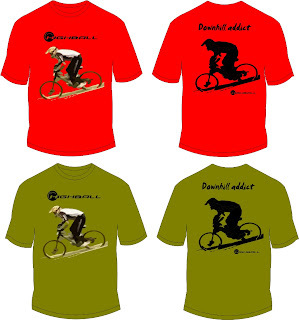 I've printed this downhill rider silhouette on micro mesh polyester jerseys for some of my clients but now you can print it yourself on your favorite blank cotton T shirt. 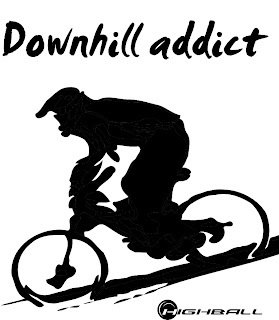 I love my mountain bike (hard tail/cross country) and I normally wear my Downhill Addict jersey when I go biking up the mountains. I also wear it in the city for its light colors, making me more visible for drivers. Some may find it silly to see me riding a regular mountain bike and wearing this jersey but the thing is I really am a downhill lover. I get most joy and adrenaline while rolling super fast in the forest - downhill of course. 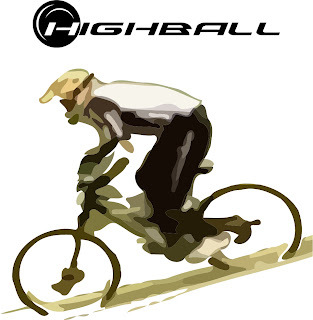 All my other mountain related sports that I occasionally perform seem less dangerous than downhill riding. I must confess I get awfully scared when I loose control of my bike - it feels extreme and the prospect of hitting a tree or falling on the trail at 45 km/h is horrible! Wear your helmet and ride safely!